Atheneum Books for Young Readers, 9780689867507, 40pp. What do you do when you can't sleep? Count sheep in Spanish and English, of course! But what happens when those rascally sheep get a little too close for comfort? Well, if you're anything like the sleepy little hero in this clever tale, you might just tire yourself out trying to get rid of them! 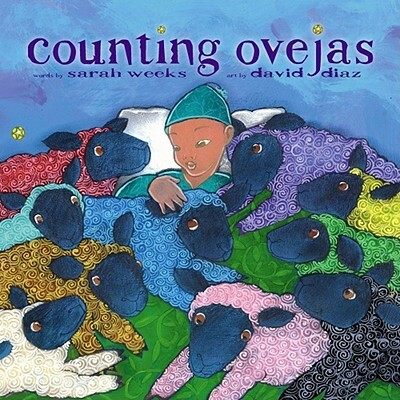 From the talented duo of Sarah Weeks and Caldecott Medalist David Diaz, Counting Ovejas is the perfect way to say good night (and learn colors and numbers) in English and in Spanish. Sarah Weeks has written many books for children, including If I Were a Lion, Paper Parade, Angel Face, So B. It, and Two eggs, please. She lives in New York City. When Sarah can't get to sleep, she goes through the alphabet in her head, trying to think of people she knew in elementary school whose names begin with each letter. DAVID DIAZ has been an illustrator and graphic designer for more than twenty-five years. His children’s book illustrations have earned him many honors and awards, including the Caldecott Medal for Smoky Night by Eve Bunting. He also illustrated the Newbery Medal winner, The Wanderer by Sharon Creech, The Gospel Cinderella by Joyce Carol Oates, Angel Face by Sarah Weeks, and Little Scarecrow’s Boy by Margaret Wise Brown, which was named a New York Times Best Illustrated Book. His bold, stylized work has appeared in editorials for national publications such as The New York Times, Washington Post, Business Week, and The Atlantic Monthly. He lives in Carlsbad, California, and more of his work can be seen at diazicon.com.